Sunday is April Fool's Day. And my birthday. (Let's try not to think very long about what the significance of that might be, okey dokey?) So in honor of me, I direct you to The Museum of Hoaxes. Here you can read about the top 10 worst April Fool's hoaxes that backfired and the top 100 best April Fool's hoaxes of all time. And we're talking about significant hoaxes perpetrated by foreign governments, national news publications, and corporate leaders, among others. Be sure to take the hoax photo quiz, too. Enjoy. Browse. Find something to try out on Sunday. You have read this article time-wasters with the title March 2007. You can bookmark this page URL http://jenkrebs.blogspot.com/2007/03/the-museum-of-hoaxes.html. Thanks! Think you know your Eames from your Ikea? Take this fun design quiz and decide whether each fashion item or furniture piece was designed in the past or the present. You have read this article quizzes / time-wasters with the title March 2007. You can bookmark this page URL http://jenkrebs.blogspot.com/2007/03/quiz-mod-or-fraud.html. Thanks! Friday night while my hubby was away on business, I was home alone feeling introverted. So I watched Will and Grace reruns and cut out paper pieces to make this lucky bamboo plant. It's from Epson's Hong Kong site, which I found via Paper Forest. I like how it turned out. I think it's cute and funny, the same way I think our fake fireplace video is funny. I'm a nerd. Oh, and if you decide to download the PDF, don't be daunted when you discover that the instructions are in Chinese. You won't need them. You have read this article downloads / paper / printable / tutorials with the title March 2007. 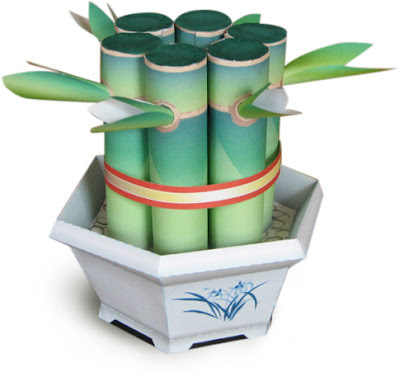 You can bookmark this page URL http://jenkrebs.blogspot.com/2007/03/make-paper-bamboo-plant.html. Thanks! This website makes me laugh out loud. Mary and Kimberly post kooky vintage clothing patterns at Threadbared.com and write snide captions for them. 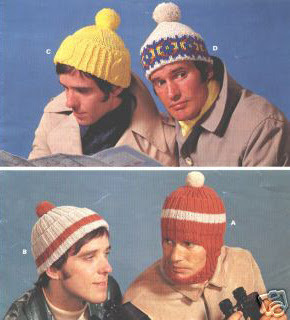 Enjoy a tour through the decades of fashion (the 70s is especially nice, I think) and start snickering. You have read this article with the title March 2007. You can bookmark this page URL http://jenkrebs.blogspot.com/2007/03/good-for-laugh.html. Thanks! I'm in the early stages of putting together an online portfolio that will show my professional work and tell a bit more about what I do. Although it's great fun to decorate my living room and play with glue and scissors, I spend most of my time working as a graphic designer. Stay tuned... I'll let you know when it launches! You have read this article with the title March 2007. You can bookmark this page URL http://jenkrebs.blogspot.com/2007/03/website-in-works.html. Thanks! UPDATE: You can buy buttons to cover that have flat backs so you don't have to yank off the wire loops! I didn't know this when I made mine. Shoot. Could have saved myself some work. You have read this article fabric / tacks / tutorials with the title March 2007. 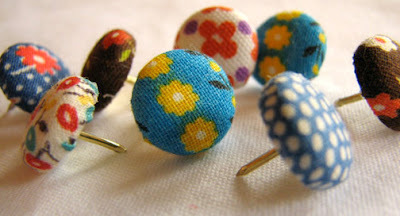 You can bookmark this page URL http://jenkrebs.blogspot.com/2007/03/how-to-make-decorative-thumbtacks.html. Thanks! You have read this article tutorials with the title March 2007. You can bookmark this page URL http://jenkrebs.blogspot.com/2007/03/crafty-projects-you-can-do.html. Thanks! Here's a fun online tool. Upload any photo, click a button, and presto! 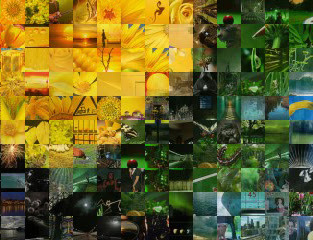 Your image is converted to a mosaic made of tiny photos from Flickr. Above is my original photo next to the finished product, shown at 10% size, followed by a full size detail. Very cool. Try it here! You have read this article time-wasters with the title March 2007. You can bookmark this page URL http://jenkrebs.blogspot.com/2007/03/photo-mosaic-generator.html. Thanks! 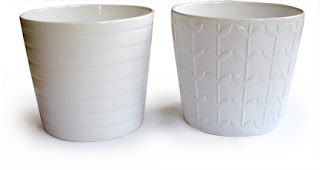 I just got these ceramic pots from Ikea for a couple bucks each. I LOVE them, esp. the one on the right. It looks Orla Kiely-esque. I shall grow herbs in them. You have read this article favorite things with the title March 2007. You can bookmark this page URL http://jenkrebs.blogspot.com/2007/03/ready-to-grow-things.html. Thanks! I love all the patterns and textures you find in magazines like Domino or catalogs like West Elm. So I cut out tiny scraps from photos of pillows and tablecloths and people's shirts and made them into magnets. Some sets I sold, and some became small gifts. 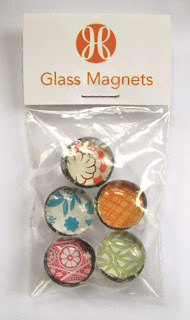 Materials: glass marble thingies from Walmart or anywhere; scissors or round punch; gel craft glue to stick your paper to your marble; round magnets; glue gun to stick your magnet to your marble. 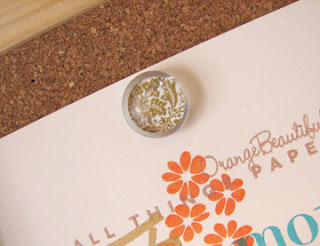 You can also glue a tack to the back and use them on your bulletin board. Recognize that wallpaper from the Brocade Home catalog? You have read this article paper / tacks with the title March 2007. You can bookmark this page URL http://jenkrebs.blogspot.com/2007/03/old-magazines-put-to-good-use.html. Thanks! You have read this article quizzes / time-wasters with the title March 2007. You can bookmark this page URL http://jenkrebs.blogspot.com/2007/03/not-so-visual-or-intuitive.html. Thanks! You have read this article decorating / home with the title March 2007. You can bookmark this page URL http://jenkrebs.blogspot.com/2007/03/graphics-in-bathroom.html. Thanks! So my good buddy Megan was moved by my shoe size angst and felt inspired to find me some websites listing celebrity shoe sizes. In case anybody wondered (unlikely), the following ladies also wear size 11s: Uma Thurman, Kate Winslet, Heidi Klum, and Paris Hilton. Oprah's a 10.5; not bad. And I believe all of this, because the internet never lies. You have read this article random with the title March 2007. 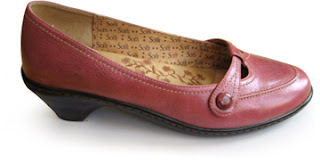 You can bookmark this page URL http://jenkrebs.blogspot.com/2007/03/some-big-shoes-to-fill.html. Thanks! Here are references I wish I'd had when starting the napkin project. Thanks, Flibbertygibbet, for the suggestion. The following tutorials are from Primrose Design's stitch school. Learn how to choose supplies (needle, thread, hoop) here. Fortunately all this stuff is really cheap. Also pick up a fabric marker to use for drawing your stem and leaf shapes on your napkin. Choose a "disappearing" marker that fades away later. Use this stem stitch to make stems. It turns out it's the backstitch flipped over. I'm so pleased to find I accidentally used a real, bona fide stitch! (For the most part.) I divided the embroidery floss to use 3 strands. Use this satin stitch to make leaves. 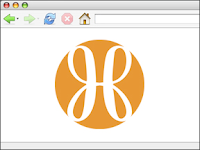 You have read this article tutorials with the title March 2007. 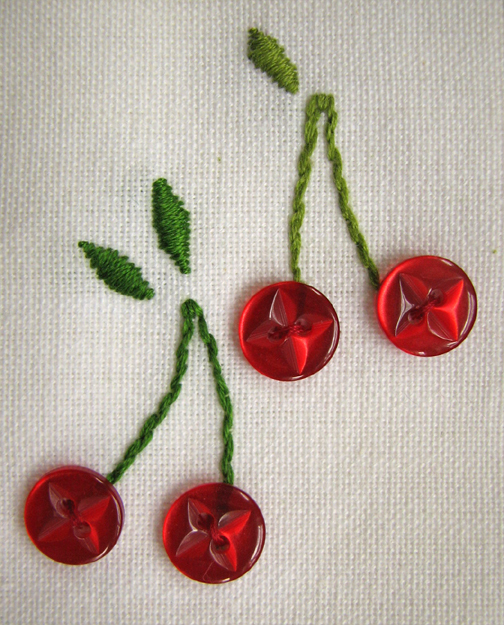 You can bookmark this page URL http://jenkrebs.blogspot.com/2007/03/how-to-embroidery-stitches.html. Thanks! You have read this article entertaining / fabric / tutorials with the title March 2007. 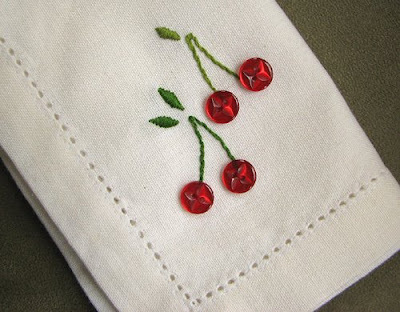 You can bookmark this page URL http://jenkrebs.blogspot.com/2007/03/fruity-button-napkins.html. Thanks! I first saw this when Jamie at Insidesign posted it awhile ago. You can take a super quick online Colorgenics test, designed to reveal your mood and emotional state based on colors you select. Alex and I were pretty surprised when we read my profile, which fit amazingly well. I became skeptical, though, and thought maybe all the profiles would fit equally well because they're rather general. Not so. I put in "fake" choices I wouldn't pick, got different results, and they weren't a good match for me. Tell me if your profile fits you! You have read this article quizzes / time-wasters with the title March 2007. 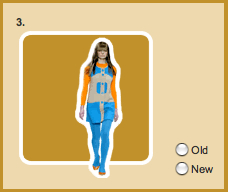 You can bookmark this page URL http://jenkrebs.blogspot.com/2007/03/color-personality-quiz.html. Thanks! 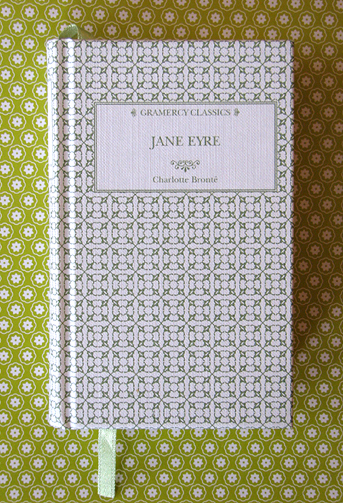 I ordered this edition of Jane Eyre, one of my favorite books, from Amazon. I couldn't resist. It's one of the new mini Gramercy Classics with the tiny patterned print on the cover. Just $5.99. How could I pass it up? You have read this article favorite things with the title March 2007. You can bookmark this page URL http://jenkrebs.blogspot.com/2007/03/for-your-reading-pleasure.html. Thanks! 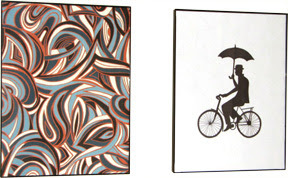 I found this graphic wrapping paper at Old Navy awhile back, and the guy on the bike is an illustration I bought from istockphoto.com. My printer wouldn't print large enough, so I traced him onto white sketchbook paper and colored him in with a Sharpie. Instant art. You have read this article decorating with the title March 2007. You can bookmark this page URL http://jenkrebs.blogspot.com/2007/03/cheap-framed-art.html. Thanks!